Waterjet cutting technology continues to be a leading process due to its versatility and quick turnaround capability. Manufacturers are realizing that there are virtually no limits to what waterjets are capable of cutting and machining. Shops of all sizes are realizing greater efficiency and productivity by implementing waterjets in their operations. Waterjets are becoming the machine tool of choice for many fabricators. Since abrasive waterjet technology was first invented in the early 1980s, the technology has rapidly evolved with continuous research and development. What makes waterjets so popular? Can cut with a narrow kerf, and can provide better usage of raw material since parts can be tightly nested. Can cut virtually any material, up to 9″ thick without edge concavity typically seen in flat bed cutting. Significant cost savings per part in industries that have traditionally defined productivity by cost per hour. CGR can fabricate products of most all shapes and sizes utilizing a waterjet cutting process. 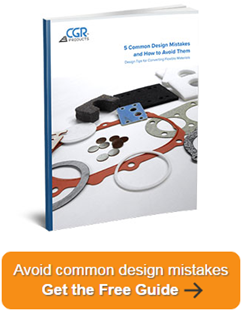 waterjet cutting is an ideal choice for samples, prototypes, and quick-turn jobs. CGR Products uses a high pressure stream of water to cut, with our waterjet cutting offering excellent material yield and the ability to cut materials that are more difficult to cut with a die. Utilizing a CAD operating system, CGR Products waterjet equipment has a rapid changeover time and allows for easy dimensional changes to parts. The CGR waterjet is capable of cutting rolls up to 76″ wide and of unlimited roll length. Our waterjet fabricator CAD system design allows for maximum yield gains compared to standard press die cutting and it’s four head design allows for multiple cuts for faster production time. CGR waterjet cutting services allow us to fabricate product from the thinnest gage flexible, pliable shim materials (0.002″) up to 9″ foams. The CGR waterjet’s requires no tooling or tool maintenance, lowering your initial set up charge. Our non-abrasive waterjet cuts non-metallic items. Our abrasive waterjet cuts hard materials such as metals and thick plastics. All our waterjets are environmentally friendly, are CAD reading and design capable and allows for .dxf and .dwg files. View the table below for more information, or feel free to contact CGR today. Can you duplicate parts from a sample part? In most cases — contact us and tell us about the details of your project.